with your mission. 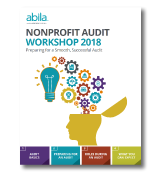 Keep reading for an outline of best practices using the Nonprofit Audit Workshop 2019. Talk to peer organizations for overall guidance and to get specific referrals. Allow plenty of time to plan and execute a request for proposals (RFP), if needed. Look for auditors with relevant experience. If you’re a small membership-driven organization, don’t use an auditor who specializes in large grant-funded nonprofits or tribes. Find out what level of detail your auditors will provide. Just the basics to satisfy reporting requirements? Or a comprehensive analysis that compares you to peers? Ask your auditors how they can help you if they happen to uncover fraud. Collect relevant documents and figures year-round. Establish a clear timeline and work milestones with your auditor. Hold a kickoff meeting that includes both the audit staff and your own finance team, so everyone is in sync about timetables and duties. Prepare electronic and hard copies of an “audit binder” with standard documentation for bank accounts, investment accounts, fixed assets, payroll, and so on. Designate one person – probably your controller – as the single point of contact for when the audit team has questions. Once the auditors have completed their analysis and submitted their final report, or opinion letter, to your board or audit committee, it’s time to address any concerns. If auditors cite weak internal controls, shore them up, for example, by using an accounting system with auditable system logs or a more proactive fraud detection system. If auditors cite operating inefficiencies, consider what would improve your finance operations. For instance, you may need better tracking of funds for each grant. Keep an audit file for documents typically examined in audits. Maintain a file of restricted donations. Segregate cash and non-cash donations in the general ledger throughout the year. Continually evaluate your record-keeping to identify opportunities for improvement. For all the details on sailing through your audit with flying colors email us for your Guide: Nonprofit Audit Workshop.